I’ve always loved crafts- specifically the kitschy, grandmotherly ones like embroidery. I first discovered embroidery when I was around seven or eight years old. As a child of the 90s, I was always sewing clothes for my beanie babies and the craft kit section at Joann Fabrics was one of my favorite places. I remember my first embroidery project was stitching an outline of a kitten in a basket, using all pink thread, onto a light green tank top. I proudly wore my kitten embroidery and told anyone who would listen about how I stitched it myself, but embroidery was only one of several craft hobbies I had at the time, and my obsession with making fairy dolls out of yarn and fairy houses out of shoe boxes came next, so many years passed without another embroidery project. After this past year of no longer being on Instagram, I found myself with fewer time-wasting distractions. With my only remaining social media being Pinterest, it was only a matter of time before I would start looking at embroidery projects and become inspired to pick it back up again. The first project I worked on this past year was a little patch which I made for my Mom. I didn’t draw a design for this one, I just freehand stitched some bluebells using a french knot technique. It was a very simple project, but it was my first time using several new stitch techniques and I learned a lot in the process. After spending more time learning about embroidery, I came across the work of an embroidery artist named Vera Shimunia. 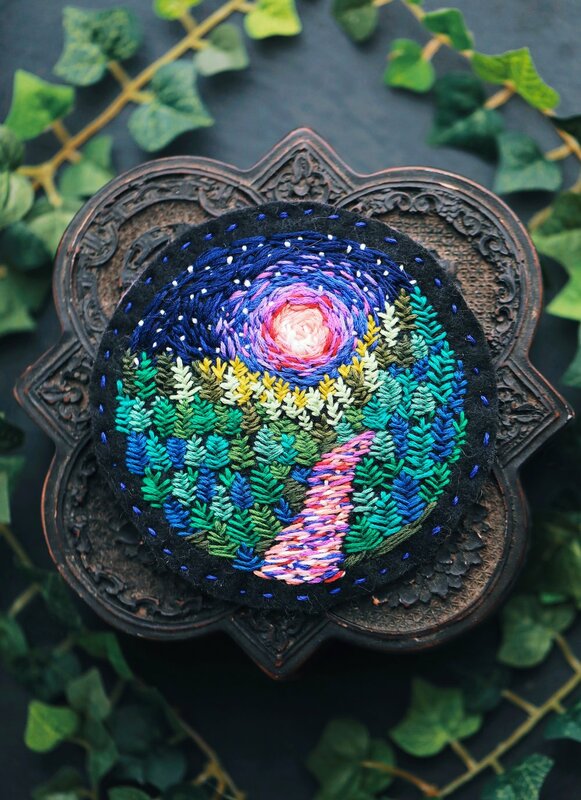 Her artwork mainly consists of colorful landscapes which she renders using thread and a technique called needle painting or thread painting. It’s essentially using threads to create the look of brushstrokes, and I had never seen anyone do this before, so I started learning all about it and I was really excited to practice the technique myself. For my first needle painting landscape project, I decided to try to replicate one of Vera’s designs so I could learn more about how it works before attempting to draw and then embroider my own design, so I stitched my own version of one of her beautiful moonscapes, using her artwork as a reference. After completing this project, I finally felt like I was starting to understand the technique a bit more and realized that needle painting is just a study of light and shadow, just like photography or life drawing. I was feeling ready to draw my own designs so I decided to try making a portrait of my rabbit, Violet. I started by doing a couple of practice sketches on paper, using a photo of her as a reference. Then, after practicing for a bit I drew the outline onto some fabric using a pen. I began by placing stitches around the tips of her ears and worked my way down. This was my first time using a blending technique called the long and short stitch, where you blend different colors and tones of threads together by laying them down in a series of long and short stitches. An embroidery artist named Trish Burr has written a many books on the technique and also has some very helpful videos available. After embroidering three very different subjects in the past year, I had the most fun working on the portrait of my rabbit, Violet, so I plan to continue to practice pet portraits and focus on learning and improving my realistic portraiture rendering. Someday, I’d love to offer custom embroidered pet portraits and other embroidery pieces here on my blog. A few years ago, eating healthy food and spending time preparing meals used to be my absolute last priority. I was the definition of a junk food vegetarian, subsisting almost entirely on cheese flavored crackers, frozen pizza, and boxed mac and cheese. I was anxious, depressed, and I hardly had an appetite so I didn't think about my food choices at all and thought that spending money on food was a waste. 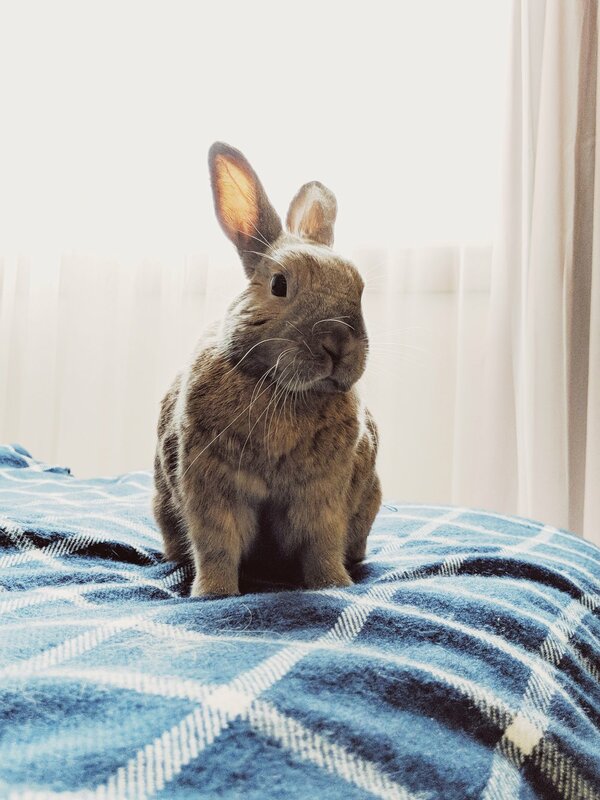 I'd actually do the majority of my grocery shopping in the frozen/processed section of the dollar store, and only visit the grocery store when I needed to buy kale... for my rabbit. I was tired all the time, my BMI was dangerously low, and I felt like I had to wear makeup every day because my skin was constantly breaking out, but I thought that because I was thin it didn't matter what I ate. Since I've been underweight my whole life, as a teenager my pediatrician would even encourage me to binge on junk food so that I could possibly gain some weight, but what I didn't realize until I got older was that being thin does not equate with being healthy and that junk food was just as unhealthy for me as it would be for someone struggling to lose weight. The more I ate this way, the more I hated food. Every time I'd eat, I'd have less energy and feel a little more sick, so in an attempt to feel less sick I would eat smaller portions of the junk food, but that wasn't making me feel better either. I knew that I'd eventually have to learn how to cook and prepare healthy foods, and even before learning anything about nutrition I instinctively knew that whole fruits and vegetables were the magical foods that I needed to be eating more of- the problem was that they just didn't taste that good to me and I had no idea how to prepare them. It took a lot of daily practice and about one full year of cooking every day before I felt comfortable in the kitchen. 1. Allow yourself to spend a lot of time in the kitchen at first. When I first started learning how to prepare whole unprocessed plant foods, chopping a sweet potato was terrifying. I had rarely used kitchen knives before and since I didn't have the skills, the process of preparing these foods went by painfully slowly. It would take me fifteen minutes to chop a single vegetable and after all that time spent chopping, I wouldn't even know how to flavor it so I'd end up with something that tasted bland, boring and seemingly not worth the effort. Overtime though I got a little faster at chopping and tried many recipes which taught me how to use different spices and flavors to make the food actually taste good. I realized that a big part of what held me back from learning how to cook was the frustration I had with myself for not knowing my way around a kitchen. 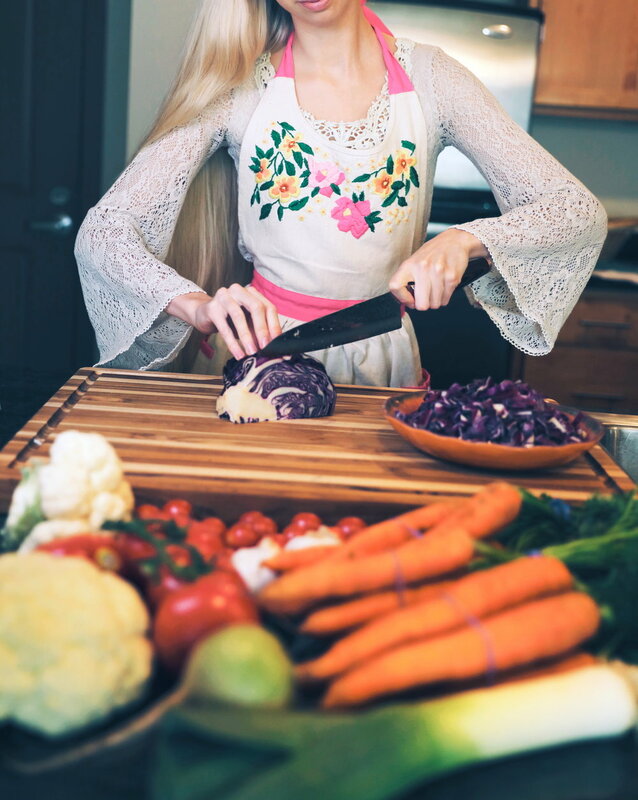 When I decided that eating healthy foods was going to be a priority, I had to remind myself every day that it's okay to be a slow and unexperienced cook and that the only way I'd ever get better was if I prepared food every day, several times a day, until it became easier. After about a year of cooking every meal from scratch, chopping seven different kinds of vegetables for a soup became no big deal. I'm glad I took it slow while I was learning because now I have the confidence to use big sharp knives and to work a little faster-and I kept all my fingers in the process! It's more than okay to work slowly and make mistakes, it's a necessary part of the learning process and it gets so much easier with practice. 2. Pay attention to how you are feeling after each meal. Around the time that I got into making healthier food choices, I was also learning about managing my anxiety and depression through the practice of bringing my focus back to the present moment and letting myself experience the feelings I had been running away from. 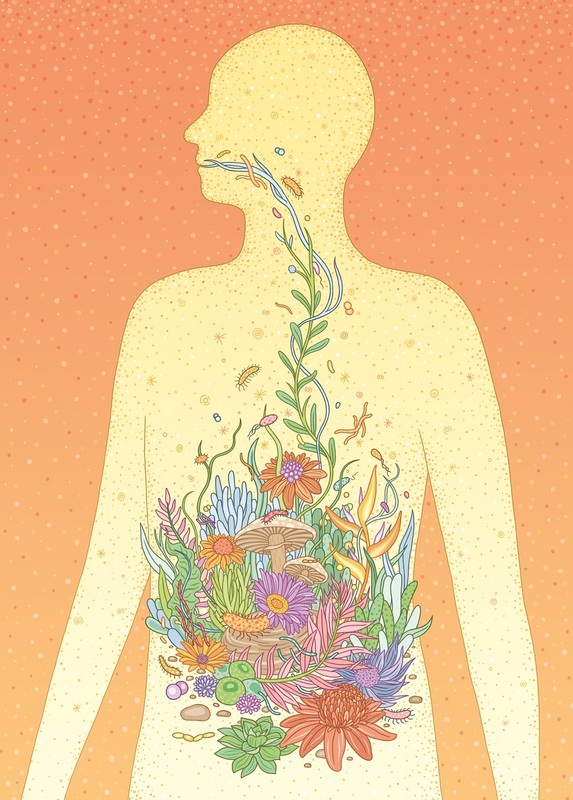 Along with letting myself face difficult emotions, I was also being more present with the physical sensations in my body including the way my body felt after I'd eat certain foods. When I first went vegan I ate a lot of oil-based faux cheese and plant based meat substitutes, but after eating them I'd take a moment to check in and see how they were affecting me. I realized that when I'd have poor digestion or skin breakouts, it directly correlated to what I had been eating. On the other hand, the more whole plant foods I ate the better I felt. After making a conscious effort to notice how these foods were making me feel, eventually when I saw a bag of potato chips or vegan cheese crackers at the grocery store, I didn't see it as food anymore. Real food became the colorful fresh items in the produce section, which gave me energy and lifted my mood, not the stuff with ingredient labels that made me feel low and clouded my head. Don't expect to stop craving junk food overnight, but when you do occasionally have processed junk food just take the time to check in and see how it's affecting you. After making it a habit to pay attention to how each meal affects how you feel, it gets much easier to make the healthy choice. Our gut bacteria, which communicate directly to our brain, will cause us to crave more of whichever foods we're currently eating, so after a few weeks of consistently eating unprocessed whole plant foods, you'll find yourself craving a nice bean soup instead of something processed. Alternately, if you were eating healthy foods but then decide to have a bag of chips, for the next few days you'll likely spend a lot of time craving more chips and will find it harder to make the healthier choice again. This is why complete abstinence from these factory made food products is the most effective strategy for longterm healthy eating habits. 3. Find healthy whole food alternatives for all of your favorite comfort foods. No cow's cheese, vegan cheese, or nuts required to make this creamy cauliflower-based sauce! Ever since I can remember mac and cheese was my #1 favorite food. Growing up as a vegetarian in a house of meat-eaters meant that I always had to have my own separate meal, so to make things easier I ate a lot of frozen veggie burgers and boxed mac and cheese. I always had some vegetables on the side, but only if they were covered in a cheese sauce. Needless to say, giving up cheese was bound to be a difficult process for me. When I went vegan and learned about what happens to dairy cows and their babies I stopped eating all dairy products including cheese overnight, but my cravings for heavy, creamy foods continued. At first I curbed my cravings with processed vegan cheeses, then when I got confident enough in the kitchen I started making my own cheese sauces from soaked cashews and almonds. Most of the vegan mac and cheese recipes I found called for a whole cup or more of nuts, and I was finding that while these sauces were so heavy and delicious, I would break out after eating too much of them and they didn't make me feel my best, so I started lowering the amount of nuts in the cheese sauce recipes and I experimented with making my sauce bases from mostly vegetables instead. I was surprised to find that these vegetable-based homemade sauces were just as good if not better than the ones that contained mainly cashews! I developed cheese sauce recipes made from sweet potatoes, butternut squash, and even cauliflower, all of which taste creamy and delicious with very few nuts or seeds needed. While the processed vegan cheeses will definitely taste more like cow's cheese, these savory creamy sauces made from vegetables are just as satisfying in their own way, and the best part is how great I feel after eating them. Making the decision to fuel myself with nutrient-dense whole plant foods is the best decision I ever made and sticking to it has been easier than I'd ever imagined it could be. Patience with yourself while learning how to prepare these foods, paying attention to how you feel after eating, and finding healthy alternatives to your favorite recipes will make the process fun and not feel like such a chore. Take things day by day and overtime you'll find that no willpower is required anymore and you'll naturally gravitate towards the foods that your body really needs. 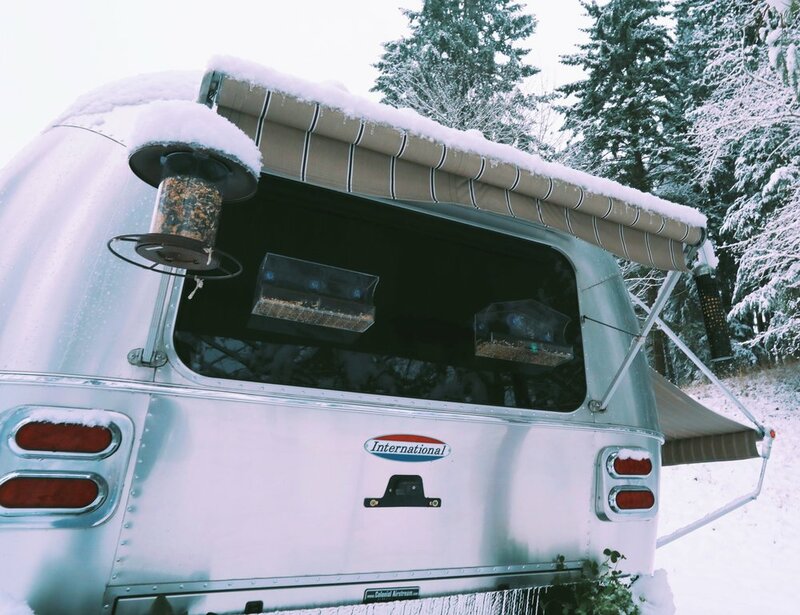 In January of 2017, we moved out of our studio apartment in Manhattan and into an Airstream travel trailer to live in full time while we relocated to Washington state. We spent our first month in the Airstream traveling, parking at a different campsite nearly every night while we slowly made our way across the country, covering roughly 5000 miles in total. We started at the Airstream dealership, Colonial Airstream in New Jersey, and headed south through Virginia and Tennessee and then started moving westward through Texas, New Mexico and Arizona, all before going north again up through California and Oregon and eventually arriving at our final destination near Seattle, Washington. It was this long trip that made us fall in love with this lifestyle. Living in a travel trailer gave us the freedom to all travel together, our rabbit included, and have adventures in amazing new places every day, but still be able to come back to a place that felt like home. One we arrived in Seattle, we found a long term parking spot where we have lived in the trailer for the past year. While we loved traveling, Anthony's job is in Seattle, so after our month long adventure moving here we knew we were going to have to enjoy a more stationary life in the Airstream. In all of our "What Could Go Wrong?" lists and planning we had made before we began our Airstream adventure, we fully expected most of the problems to arise during the month of travel and figured that once we arrived at our final location it would be smooth sailing from there. Surprisingly, it was just the opposite. While we travelled, everything worked out almost perfectly, there were no major issues to report all throughout our trip, and when we arrived in Seattle we were so relieved to start living in the trailer in a fixed location. It started feeling like an actual home and we were able to start a garden and see a different, maybe slightly less adventurous part Airstream living. Little did we know, this is when the real adventures and lessons would begin. I'm going to start with the cons or the negative experiences we had while living in our Airstream so that we can end on a positive note. It doesn't feel right to even say anything bad at all about our experience because overall, we loved it and would do it over again in a heartbeat, but I think some of what we experienced, the good and the bad, could be helpful if this is a lifestyle you're interested in and want to hear about the full spectrum of experiences we had. These are just the little minor inconveniences we don't hear mentioned too often about what it's really like to live in an Airstream full-time. When you first move in, expect lots of small injuries. The process of adapting to a smaller space involves a lot more cuts, bangs and bruises than we had anticipated. Whether it's bumping your head on the light fixtures or smashing your elbow coming too quickly around a sharp corner, expect to get a little beat up while you form that muscle memory that eventually guides you more smoothly through your new space. Metal riveted walls look beautiful, but they can and they will eventually cut you. Every single time I wiped down the walls especially around the kitchen, I'd get cuts from the sharp edges of the metal. It's not jagged metal or anything, but it's blade-sharp metal that leaves thin, fast-healing cuts. Obviously still not ideal, but just something to be aware of when polishing those shiny walls. I managed to overdraw on power almost daily and we had 50 amp hookups. This wasn't such an issue when we were travelling, but once we were parked for good and we got out the rice cooker, blender, and several more kitchen appliances, the limits of 50 amp power became much more pronounced. The layout of an Airstream is designed for travel and adventures, not for being parked in the same spot for a year like a stationary home. While we enjoyed our time in that one spot, we found ourselves not going out as much as when we were travelling and through staying inside a lot the furniture seemed to get less and less comfortable everyday. This is no fault of the Airstream, but just a sign that if we weren't going to be using the trailer for travel anymore like it was intended, we would have to make some modifications for it suit our needs. The time someone tried to break in at 2 a.m.
Our long term parking spot was located in the town of Bothell, a rapidly growing suburb of Seattle, which had always felt like a pretty safe place to be. We lived near an RV park, but a little out of the way in one of their long-term spots on a hill top surrounded by a beautiful meadow and lots of tall trees. We had two other RV neighbors, but they both had homes and only stayed in their RVs during the work week, so we were usually all alone on the weekends. One rainy Saturday night in November of 2017, we awoke to some strange sounds coming from the outside of our trailer. It sounded like someone or something climbing on the Airstream and then we thought we heard someone try to open the door as well, which was locked. We turned on the lights and tried to figure out what was going on and that's when we heard yelling. Anthony looked out the window to try to see who it was and that's when he saw a man standing on top of the trailer next to ours smashing his foot through their roof vent. Immediately he called 911. Five minutes later a police officer arrived and then shortly after several more police officers showed up. They told us they believed someone was inside our neighbor's trailer. We told them no one was supposed to be in there because the family that lives there goes home on the weekends. They surrounded the trailer, guns drawn, and yelled through the megaphone urging the occupant to come out of the trailer several times. Eventually they pried off the door and sent in a police dog followed by several officers. What happened next was the craziest thing I've ever seen. Out of the trailer came the dog and multiple officers escorting out a completely naked man in handcuffs with pupils the size of dinner plates. All of the officers cheered-- they seemed very happy to have caught the perpetrator and that no one was hurt. They tried to get him to sit down but it was apparent that he had consumed a lot of meth and was covered in injection wounds. They kept trying to give him a blanket to cover up with but he threw it on the ground repeatedly, determined to stay completely naked. The cops later told us that he admitted to leading them on a high speed car chase earlier that night, ditched his jeep at a local auto shop and took off running before ending up on our hilltop where he was trying to find a place to hide out. He was trying to get into our trailer, but since it's rounded and it was raining, he wasn't able to get onto the roof. He must've heard us wake up and that's when he started yelling before climbing up the ladder on our neighbors trailer, which has a flat roof, and found it much easier to get inside. While he was inside our neighbors trailer he took off all his clothes, did some more meth, drank their milk, and relaxed in their bed. It didn't seem like he was there to steal anything, but more like he was just really high on meth and didn't know what was going on anymore. He kept telling the police they'd need to buy him a new door for his trailer. The owners of the trailer showed up a few hours later and were very fortunate that they, and their two small children, weren't home when this guy came crashing through their bathroom ceiling vent. He was arrested for vehicle prowling and spent a night in jail before being released with a pending court date. After this terrifying experience, it really began to sink in for us that while our trailer felt like a home, we were actually living in a vehicle, which means we don’t have the same legal protections as if we were living in a house. We still felt fairly safe knowing that our Airstream was more difficult to break into than other trailers, and if anything this put the Airstream through an interesting safety test, but the reality of what could've happened that night gave us a lot to consider about staying safe while living in an RV. Since this incident we have taken several more self-defense and safety measures. 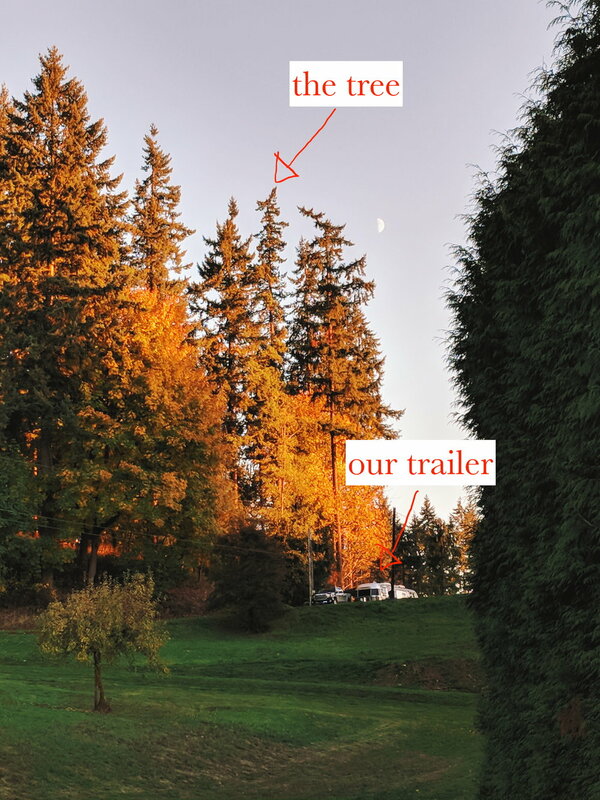 Earlier in March of 2018, A powerful windstorm brought down a giant Douglas fir tree which landed right next to our trailer while we were home. This was caused by the seven acres of forest being cleared next to us, so this tree was exposed to high winds it was never meant to endure. This was the second major close call to happen to us in that spot, and we didn't want to wait around for the third strike. While we wanted to keep the trailer, we didn't have anywhere else we could park it. The land we purchased last summer doesn't have a septic or running water yet, so we couldn't take it out there, and all of the RV parks in our area aside from the one we were staying at would be a very far drive from Anthony's work. This is why we made the sudden decision to move out and sell our trailer. For the full story check out my post here. 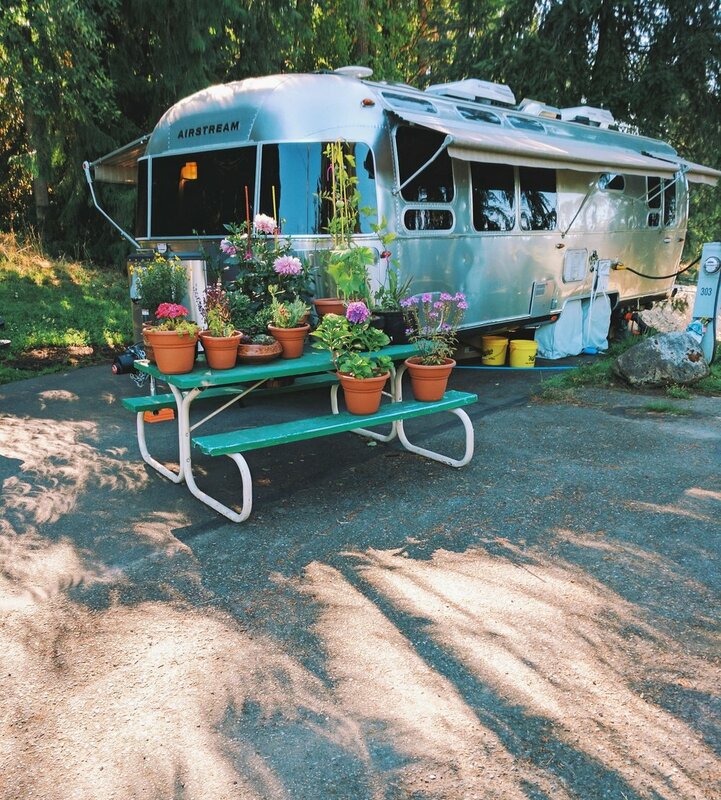 Overall, we loved our experience of living in an Airstream travel trailer. While our time spent traveling and staying at a new campsite every night was by far the best part of the lifestyle, it was still an amazing experience to live in the Airstream in a fixed location. It really began to feel like home. We expected with our daily living and use of the trailer that eventually something would break and we'd need to take the trailer in for repairs. We figured maybe it'd be the water heater failing, or the AC breaking, but to our surprise and delight nothing major ever broke. Some minor things broke- the small round mirror in our bathroom fell off the wall during our travels and our awning arm got bent in a wind storm, but nothing major failed on us the whole year that we lived there. 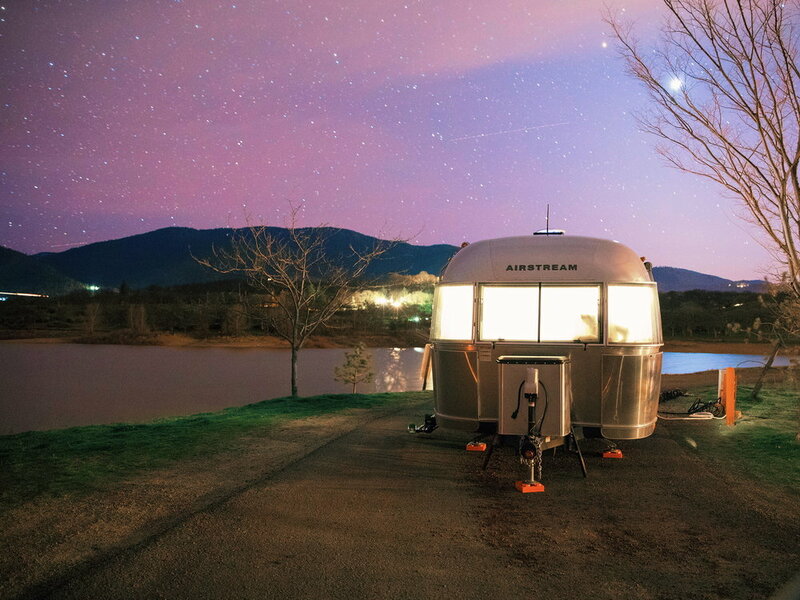 Airstreams are built to last and we experienced that first-hand. Living in a smaller space also helped us to stay more organized. There are so many little storage nooks in creative places all over the trailer, so there was always a place for everything, and while we couldn't have tons of items fit in there, everything that we did own had a place. The small size of the place also made cleaning much easier. Vacuuming takes only a few minutes in a trailer and having less space really inspires you to keep the free space that you do have clean and tidy. Since we chose the International Serenity model of Airstream, which has more windows instead of overhead storage, our space was always bright which made us feel much more connected to the outdoors. The kitchen in the Airstream is in many ways better than any apartment kitchen I've ever had. The convection oven/microwave can cook anything, and some things it cooks much better than any regular oven could. The sink is super deep, which is important since there's no dishwasher, but you could tell a lot of consideration was put into these small things and it made using the Airstream kitchen daily a very pleasant experience. If you love to cook, you won't be sacrificing anything that you love about cooking while living in an Airstream. We were worried that living in such a small space would start to feel cramped or restricted, but that was never our experience. There was just enough space to feel comfortable and we rarely found ourselves wishing we had more room. Even after a full year of living there and acquiring more things, we always found creative ways of storing them. We were definitely glad to have decided on the 30 ft. trailer for our full-time living situation. The trailer passed an important, albeit terrifying, experience when someone tried to break in and failed. This was likely because of the round shape of the trailer which he had difficulty climbing on top of and also the secure lock on our door. I think if someone really wanted to break into anything, our trailer included, they probably could, but Airstream has done a good job of not making it the easiest thing in the world. If you are considering a trailer with a flat roof and a ladder on the back, I'd advise you to consider how that might invite in the wrong kind of company, even if you live in a safe place, that's still a big risk to take. Ultimately, we are so grateful for our time spent in the Airstream and we would go back and do it all over again if we could. It was an incredible experience which taught us a lot about ourselves and enabled us to have adventures that we'll always remember. One day, we might get another smaller Airstream for actual traveling as opposed to living in it like a full-time home, but for now since we don't have any travel plans and are starting to settle in to living in Washington, that won't be happening anytime soon. 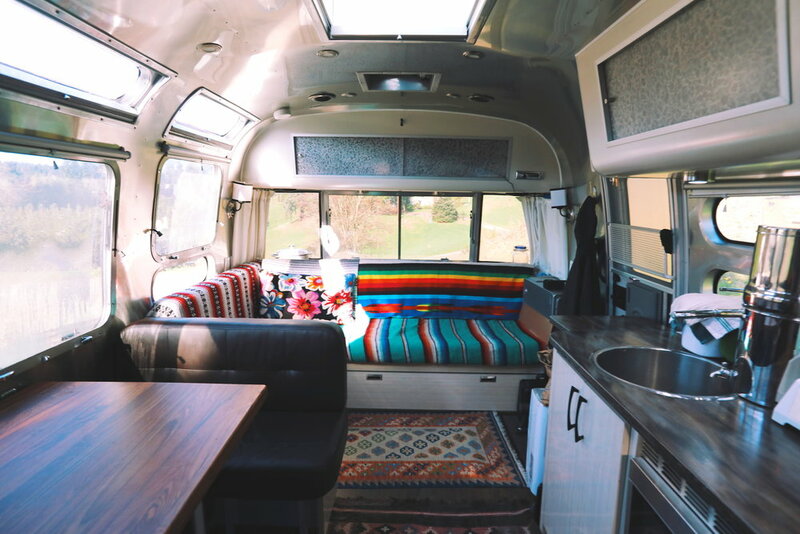 While we wish we could have kept living in the Airstream for another year while we build our house, we know we made the right decision to part with our Airstream at this point since we were no longer traveling and taking it out for adventures. For more information, click the button below to check out our videos documenting our travels in the Airstream on Youtube! Life in the Airstream Update & Lots of Cute Wild Animals Are Visiting! For the past year, I've been living fulltime in a 30 ft. Airstream travel trailer in Washington with my partner, Anthony, and our dwarf rabbit, Violet. When we made the decision to leave our apartment in New York City and move across the country to Washington, we decided that the best way for all of us to get there would be in an RV and that we would continue to live in the RV while we look for land and eventually build a house. Over the summer, we found and purchased 7 acres of beautiful forested land and are now currently in the final stages of designing the house and getting ready to start the long process of applying for building permits. Since it's been quite cold here these past few months, we haven't been spending as much time out at the property, so we've mostly been inside the trailer working on making some of the big decisions that come along with building a house. After a full year of living in our trailer, we are so happy with the decision we made. While the space is pretty small, the amount of windows and skylights makes it feel much more open. There's definitely not enough room in here to have everything we want, but it's been a good lesson in living more minimally and being careful to not accumulate stuff that we don't absolutely need. That being said, there have been certain non-essential items that we have been accumulating recently which have brought us a lot of joy and entertainment- mainly our bird feeders, of which we now have four or maybe even five... I've lost count. Most of them are the kind that suction right to the window so we can creep on the birds as they feast on their seeds. We have one on the kitchen window so I can watch the birds as I do the dishes and cook, but we also have a lot of them around our bedroom as well and it's the best thing to wake up to see beautiful birds at the window every morning. It's been so much fun to see the variety of birds that come by and to try to identify them. After a few months of feeding them, they've started growing their families and because of this we've also been getting more visits from big predatory birds like owls and eagles, but we don't have any pictures of those big guys unfortunately. Over the past few weeks we've been taking lots of pictures and videos, and we've especially been enjoying the short animated gifs that are made automatically on our phones, so i thought I'd share a few here! 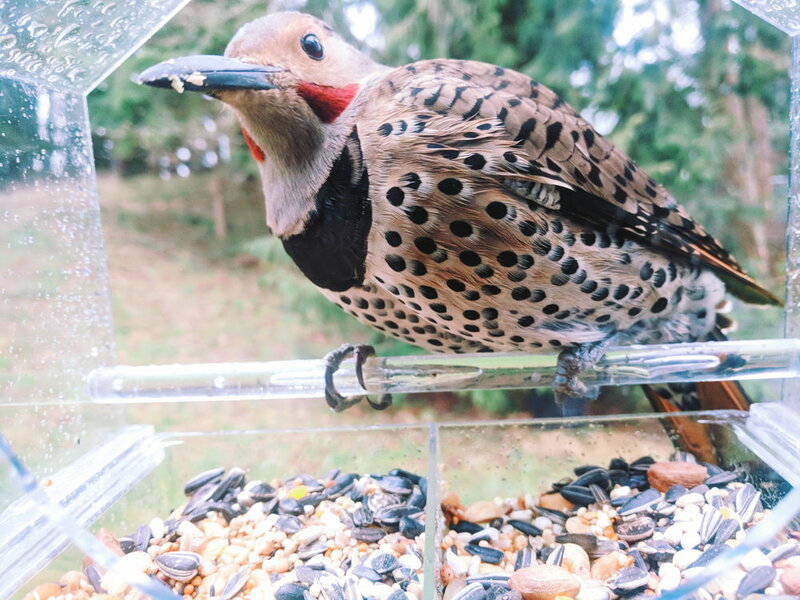 He's a type of woodpecker and one of the loudest visitors to our feeder because he likes to use his long beak to peck at the seeds and send them flying everywhere. Another bird who's been visiting lately is the vibrant blue Stellar's Jay. They usually come in pairs or small groups and have such a pretty bird song. All too often though, our most common visitors have been the squirrels. No matter where we set up the feeder, they find their way in and eat nearly all of the seeds before the birds can get any. I only have slightly more patience with them than Anthony does because they're still so cute. Then we have the deer, who we believe may be the reason our broccoli plants have some big bites taken out of them. The other day they came right up behind our trailer and we watched them graze and play in the meadow. Okay, that's probably enough wildlife photos for this update! One more thing, for now I've deactivated my instagram page @wholesomelyelle. I haven't been enjoying using it since they changed it from chronological order to an algorithm-based feed, and also since I haven't been on Facebook for the past 4 years, it felt strange to still participate in a Facebook-owned platform when that's not what I had signed up for originally. I may still reactivate it in the future, but I just wanted to take a break for a while to focus on other things. For now that means you'll be hearing a lot more from me right here on my blog and hopefully more on Youtube as well! I'll continue to post updates on life in the Airstream and more healthy recipes will be coming your way this week so check back in for more soon! We all experience sadness every now and again, especially during certain times in our lives and in the face of extremely difficult circumstances. There are times when it’s completely appropriate to feel sad, and that sadness is something that we can’t expect to be cured through diet, it’s a normal part of the human experience. But when the sadness is persistent and seems to follow us around wherever we go, that is called depression. Clinical depression is caused by a chemical imbalance in our brain, which is a problem that can sometimes be solved through making better dietary choices. There are many studies demonstrating the relationship between higher fruit and vegetable consumption and a lower risk of depression. Generally the research shows that the more whole plant foods you eat, the lower your risk of depression. There are a number of components through which which fruits and vegetables prevent depression. Lycopene, the red pigment predominantly found in tomatoes, but also present in watermelon, pink grapefruit, red cabbage, and carrots, is the most powerful antioxidant amongst the carotenoid family. If you measure the levels of carotenoid phytonutrients in nearly 2,000 people across the country, a higher total blood carotenoid level was associated with a lower likelihood of elevated depressive symptoms, and there appeared to be a dose-response relationship, meaning the higher the levels, the better people felt. Polyphenols, found in fruit and vegetables fight oxidative stress and improve the functioning of neurotransmitters like dopamine and serotonin, which are responsible for regulating our moods. And vitamin C, found in high amounts in many fruits and vegetables, is actually a cofactor in the production of Dopamine. So with this direct effect on our neurochemistry, it should be no surprise that fruits and vegetables have the ability to lift our mood. Does this mean that the answer to depression is just to eat more fruits and vegetables? Well, not quite. It turns out certain foods actually have the ability to make us more depressed. Arachidonic acid is a type of Omega 6 fatty acid found in animal-based foods with the highest amounts found in chicken, eggs, beef, sausage, and fish. The oxidation of Arachidonic acid creates pro-inflammatory compounds in our body. This inflammation in our brain adversely impacts our mental health. In this study on women, higher levels of Arachidonic acid were associated with a 45% higher risk of suicide and 47% increase risk in major depressive episodes. When people are put on a plant based diet that limits Arachidonic acid, they experienced an improved mood after just 2 weeks. Plant based diets were also associated with 30% less markers for inflammation. So when choosing a diet that will have the greatest affect on our mood, it's not just about adding in more fruits and vegetables, but also removing the animal based foods that cause inflammation, as depression may actually be a physical disease which is exacerbated by proinflammatory compounds. Thank you to Mic. The Vegan and Dr. Michael Greger of Nutritionfacts.org for gathering and organizing so many of these studies on diet and depression and making them visible and accessible to more people. Watch Mike's recent video on the subject and also this video by Dr. Greger to learn more about how our diet affects our mood. Of the many traps we can fall into on our journey towards better emotional resilience, positive thinking is a clever mirage that can lead us even further into the dark. A common topic these days is the power of manifestation and the law of attraction. "Think rich and become rich" is the promise, and if that doesn't work for you, well you must still have some limiting negative thoughts. For 1% of the population, things might pan out this way and it may seem like the positive thoughts were the cause of the good fortune. Sometimes someone may actually wish for something and receive it, but 99% of the time, our wishes will not be fulfilled by the sheer power of positive thoughts, and this outcome will have nothing to do with whether the thoughts they had were majority positive or negative. 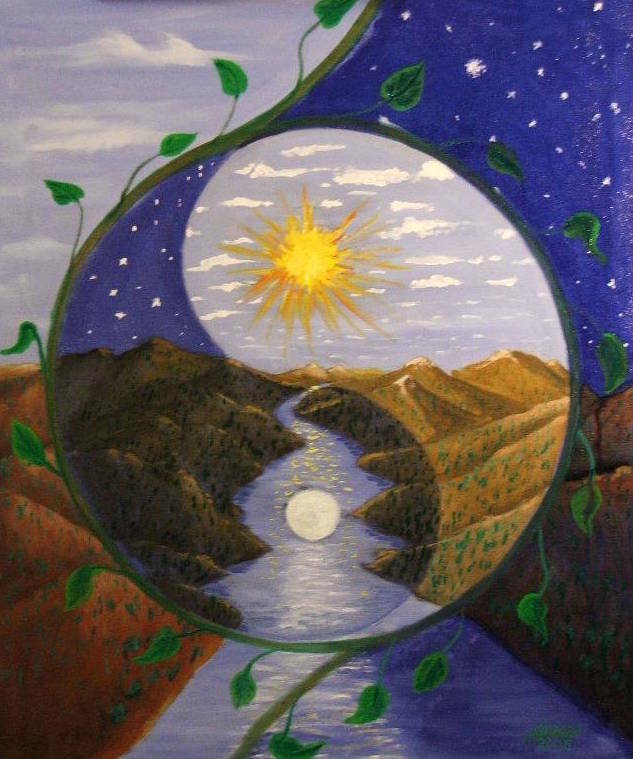 Positive thinking attempts to erase the negative, when both sides are needed for balance and wholeness. Positivity goes against awareness and asks that you choose what it is you want to see and what you don't want to see, rather than surrender and accept what is. It will only repress your awareness and cause an imbalance. At a certain point these repressed emotions will come out, there's no way around them. By smiling when you feel angry or laughing when you feel sad, you're being insincere to yourself and others. When you feel an emotion, whether you deem it to be good or bad, you must bring it into your awareness and see it fully for it to pass through. By choosing to not see emotions when they are present, they will stick around waiting for a time to be released, and it will never be the "right" time. There's nothing honorable or stoic about faking our way to appearing outwardly like happier people when on the inside we still haven't dealt with the cause of our unhappiness. To live a life full of authenticity means to ride the ups and the downs, not holding any attachment or deriving any sense of identity from either the peaks or the valleys. There are also those who have a negative philosophy, though they often don't talk about it like the positive thinkers do because there's not as big of an audience for that kind of talk. Negative thinking is just as much as of a limiting belief as positive thinking. In fact, a negative world view is often what causes the clinging to the positive in the first place. They are two sides of the same coin and both views miss the big picture. A couple of years ago, I used to suffer from debilitating anxiety and panic attacks. While living in New York City, simply stepping outside and walking along the crowded streets, was enough to send me into a full blown state of panic. I remember feeling like an elephant sat down on my chest, I wanted to run but my body felt frozen and unable to move, and then suddenly it would become very hard to breathe- this was always the scariest part. So naturally, I went to see a psychiatrist, and he wanted to put me on heavy duty benzodiazepine medications. I took these medications, and he kept having to raise the dose as my tolerance increased and the panic attacks got worse and worse. The higher the dose of medication, the more I lost my sense of self. I would forget what I was saying mid-sentence and couldn't retain any information, I basically had the memory of a goldfish. This was not a sustainable way to manage my anxiety. When I would go for my therapy appointments, the doctor would tell me I needed to sit very still and focus on taking deep breaths. Whenever I did this I felt the panic actually increase. How could I sit still with this fear coursing through my veins and while my heart felt like it would beat out of my chest? Sitting still and focusing on breathing always made it 10x worse. I began to feel like I must not be doing something right. I was following all of his instructions but was getting worse rather than better. I was losing all hope. First, we have to understand what anxiety is and why we have this mechanism to panic in the first place. Doctor Doug Lisle of Esteem Dynamics explains all of this perfectly in this video, but I will try to sum up the basics here. If we look at what anxiety is, essentially it is a warning device to tell you to avoid something. To figure out why we have this mechanism, we must look back in time at our ancestral history. About 100,000 years ago all human beings were in Africa, so a lot of what our bodies became adapted to are the problems that would have faced our african ancestors during this time. So you're walking through the tall grasses and all of a sudden you see a lion. Immediately, you're going to freeze, as not to catch the attention of the predator. This same behavior happens with panic attacks. The next thing that happens in this situation, is you start to sweat. This is meant to cool you down ahead of time so that you can be prepared to run without becoming overheated which would slow you down. Your breathing also becomes restricted, which is a mechanism designed to raise your blood pressure and allows the cardiovascular system to push blood away from your viscera and into your the muscles of your legs, preparing you to run for your life. Your body is trying to protect you and this fight or flight mode is it's best defense in times when you actually need to get to safety. Every single one of these uncomfortable symptoms are there to save your life. A panic attack isn't really an attack, it's an adaptation. So how can we work with this adaptation, rather than against it? Sitting down and breathing deeply usually won't help, and cognitive therapy where you're told that it's not a big deal, that there's nothing to worry about, usually doesn't help either. What actually does work, is to let the system do what it wants to do. As a prey species, the only thing that will break the freeze to move through the process as it would have naturally occurred. When you have a panic attack, you can stop it in its tracks by getting up out of your chair and running in place. What you'll find is after roughly 15 minutes of jogging in place you'll be tired and out of breath and you'll feel like sitting down. Your breathing will now be deeper, and your brain will see that and decide you must've outrun the predator. It will then start dialing down the adrenaline, and your state will return to normal. Alternatively, if you're in a public place or seated and you can't just start jogging in place, you can exhaust your leg muscles by crossing your legs and pushing them together for 30 seconds or so repeatedly or until your muscles feel tired. Once your muscles have been exhausted your brain will stop sending out the panic signal and your body will calm down automatically. I've found this practice to be more helpful than anything I've ever tried because it allows me to move through the anxiety and work with it, rather than suppress it and fight against it. While I rarely experience panic attacks now that my body has fully adjusted to being off medication for a few years, when I do feel anxious it's a lot less scary now knowing that I have this method to help me through it if I need it. Now you have the tools to short-circuit the attack. Try it out yourself the next time you experience anxiety or a panic attack and see if it could help you too!